Discover these ancient structures of democracy, community and relationship with life. Medicine Wheels, or Glyphs, are circular structures that have been used to map and access information (regarding natural law and the human condition) by indigenous peoples world-wide. It has been established by contemporary psychology and neuroscience that symbol and imagery are the very language used by the human brain. It’s of no great surprise therefore that these efficient systems of mapping information have been used for millennia and are now experiencing a resurgence in the 21st century. The specific system that informs the Children’s Fire Movement, called the ‘Origin Teachings of the Delicate Lodge’, is a wisdom tradition of the Americas that flourished during Mayan and pre-Mayan times (as well as in other more recent cultures). The ‘Bundle’, as it is often referred to, holds many Medicine Wheels of which the Council Wheel is one such wheel (see below). There are often eight main divisions to the wheels, from which the eight perspectives of the Council have emerged. All of the wheels are based upon one foundational wheel which is known as the Twenty Count (see above image – each set of dots and lines represent a unique aspect of natural law). The Circle of Law was a holistic system/structure of relationship (and consequently of wisdom gathering and governance) that could be applied to either a group of people or the mental construct of an individual. When all the different perspectives of the people, or individual, had been voiced, heard and responded to, the Circle of Law was then said to be awake in that person or that group of people. Each person involved is collectively responsible to ensure that all the voices/perspectives are heard. Establishing the Council and Societies (see below) is one way of awakening the Circle of Law, and, there are many more associated wheels (as mentioned above) that reveal deeper aspects of these perspectives. Next time you’re in a meeting, watch the rituals of business: the dueling egos, turf protection, talking-without-listening. Maybe it’s time for a different kind of ritual. Something old. – Fast Company Magazine, How to make decisions like a tribe. The Council consists of eight pairs (one male and one female) of representatives, originally called Chiefs, who have been chosen by the people to represent one of eight unique perspectives (see image). Unfortunately, Hollywood has often reduced the image of a chief to an incompetent leader of rebellious renegades – this is a million miles away from what it was/is to be a Chief. A Chief was not someone who sought power over others, or someone who wished to profit from those of a lesser station – they were dedicated individuals who selflessly served the People. They would hold the question, “what is needed for balance and wholeness?”. This wasn’t/isn’t a wishy washy concept but a highly pragmatic line of enquiry that is both opening and informing – the ultimate purpose of the question being to ensure the continuation of the tribe (or community, organisation, business etc). The eight perspectives, which have evolved from natural law, combine to give a response that is both holistic and life-affirming – unrivalled by modern day decision making processes. The keywords shown in the above image are succinct doorways that enable the Chiefs to source insight and wisdom from eight deep wells of understanding Life. 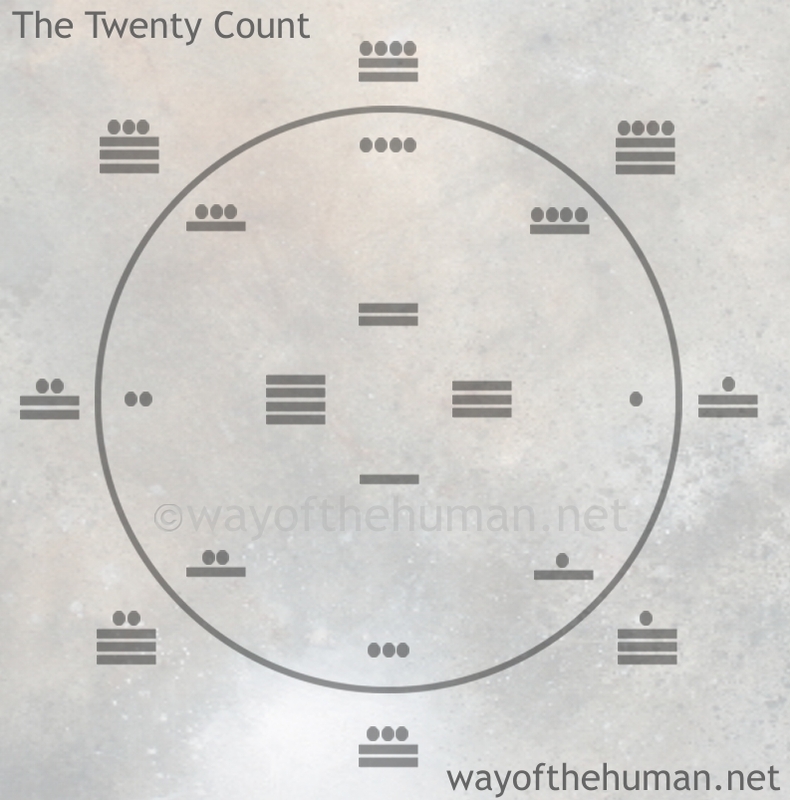 Each individual perspective could be studied for a lifetime and have their origins in a beautiful blueprint known as the Twenty Count (see the image in the Medicine Wheels section above). The question, or situation to be addressed, is brought before the Council so that they may offer their insights and recommendations. The Council does not tell anyone to do anything! They are not an enforcement agency and have no agenda other than to source and offer life-affirming wisdom for the benefit of the whole. And… the People held the deepest respect for the Council – they knew that their voices would be truly heard and that the Chiefs would have their highest interests at heart. Because of this they naturally held a deep level of trust both in the process, the structure and for the individuals concerned. As many people are now finding, these are qualities sadly lacking in our modern day democracies. As well as a pair of Chiefs in each of the eight directions, the People would also divide themselves into eight Societies influenced by which directional perspectives resonated with each individual. The societies would then collate their collective wisdom regarding the subject at hand, and offer it to the two Chiefs presiding in their direction. Unlike modern politics, there was no attachment to being ‘right’ and having a need to prove others ‘wrong’ – no perspective would be deemed better or worse than any other. The Chiefs and the Societies would be working towards a common goal for the good of the collective and would not be seeking to better, belittle or get-one-over the other representatives in any way or form – they knew that to do this would put the process, and the continuation of life (and the tribe) at risk. The Chiefs would then source the societies wisdom, along with the qualities of the perspective of that direction, and bring forward their understanding along with three or four recommendations. Once all of the Chiefs in all eight directions had presented their recommendations to the People, the People could then prioritise these recommendations into an order for moving them into action. Again, they didn’t have to act upon any of the recommendations, but this would be a very unusual situation and a potential sign that the Council structure and/or process may have fallen out of balance. 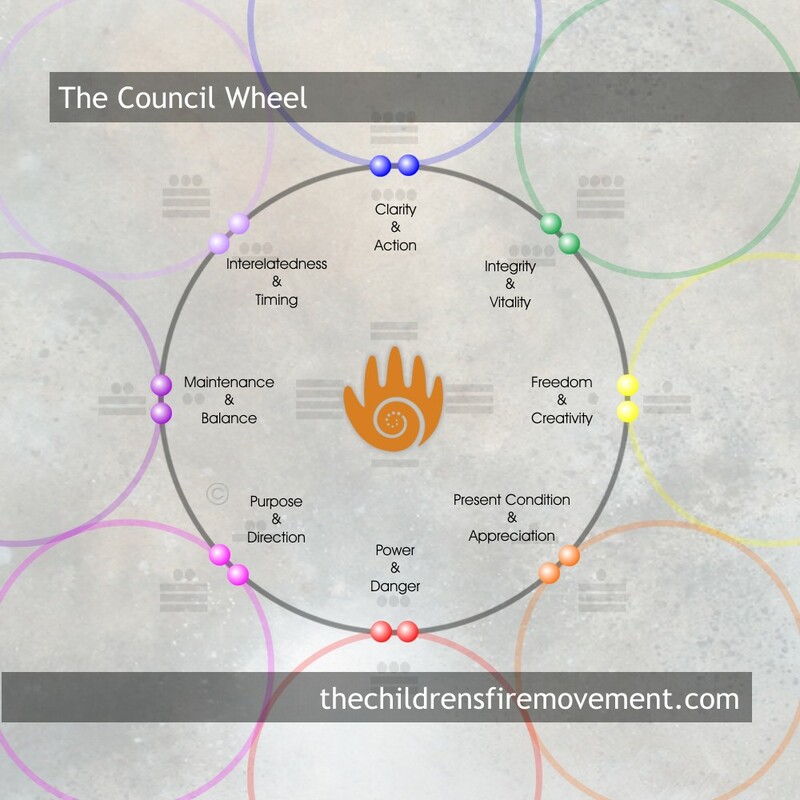 You can also check out this short article which briefly introduces some of the concepts of the Council Wheel… It’s power Jim, but not as we know it! For a number of years now individuals, from all over the world, have been able to attend a two-year Council Guide training programme. Students are taught, and experience, the foundational teachings of the Circle of Law and on completion can be authorised to guide groups of people through the Council process. If you are interested in Council Guide Training, contact us and we’ll connect you with any training programmes that may be available.